21.5% respondents in Singapore versus 17.4% in Asia Pacific consider a likely drop in demand for their products and services as the biggest challenge to business profitability in 2015. 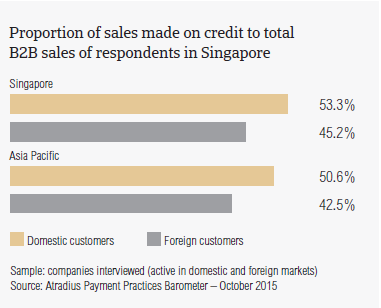 Over the past year, 92.3% of survey respondents in Singapore extended trade credit to their B2B customers. This response rate is slightly higher than that of Asia Pacific (91%). Although a minor difference, this points to a more frequent use of trade credit in B2B transactions by respondents in Singapore than by their peers in Asia Pacific. Consistent with the regional pattern, businesses interviewed in Singapore appear to be more inclined to sell on credit terms to domestic than to foreign B2B customers. Domestically, credit-based sales in Singapore average 53.3% of the total value of local B2B sales. This is above the 50.6% average for Asia Pacific. Credit-based sales to B2B customers abroad average 45.2% of the total value of exports from businesses in Singapore. This figure is also higher than the 42.5% regional average. Similar to the other countries surveyed in Asia Pacific (except for Australia) these findings for Singapore, suggest a greater perception of payment default risk on foreign sales than on domestic sales. Over the past year, the average proportion of domestic B2B sales on credit in Singapore increased by an average of 6 percentage points. This is almost twice as high as the average 3.2 percentage point increase recorded at regional level over the same time frame. In contrast, the proportion of credit-based sales to foreign B2B customers increased moderately by an average of 1.6 percentage points. This is well below the average 5.5 percentage point increase in Asia Pacific overall. While the increase in internal B2B sales on credit reflects robust domestic demand, the modest increase in foreign credit-based transactions recorded by this trade-oriented economy most probably reflects the deceleration of economic growth in China, Singapore’s largest trading partner. Additionally, it may reflect the economic conditions in the eurozone, where demand was a sluggish component of the region’s economic performance for a long time. Respondents in Singapore give domestic and foreign B2B customers an average of 31 days from the invoice date to pay for their purchases on credit. This is in line with the average payment terms for Asia Pacific (both domestic and foreign at 33 days). Compared to the same survey period one year ago, both the domestic and foreign average payment terms in Singapore increased slightly (by an average of four days). Over the past year, the businesses interviewed in Singapore experienced late payment of B2B invoices more frequently than most of their peers in Asia Pacific did (94.5% of respondents in the country, compared to 90.2% at regional level). This is the third highest response rate in the region, after those of India and Indonesia. Late payments were reported to occur more often from domestic B2B customers than from foreign B2B customers. More specifically, the total value of domestic B2B invoices which remained unpaid after the due date was higher than that of foreign ones (46% and 41.3% respectively). It is worth highlighting that the domestic figure for Singapore is slightly above the regional average while the foreign figure is below the average (44.8% domestic and 45.2% foreign). Very long overdue receivables (still outstanding after 90 days past due) averaged 7.8% of the total value of domestic, and 8.8% of the total value of foreign B2B invoices. The averages for Asia Pacific were 8.8% domestic and 11% foreign. These receivables are likely to be defaulted on by B2B customers and turn into bad debts and write-offs. Late payment of invoices by B2B customers is reflected in the average DSO, which for respondents in Singapore is 40 days. This compares to 35 days average for Asia Pacific. Matched by Japan and Taiwan, it is the highest in the region. This would suggest that businesses interviewed in Singapore tend to have a higher proportion of large B2B invoices that are not settled in a timely manner. These invoices are more likely to be defaulted on. As such, the potential exposure to trade credit risk of businesses in Singapore is higher than average for the region. 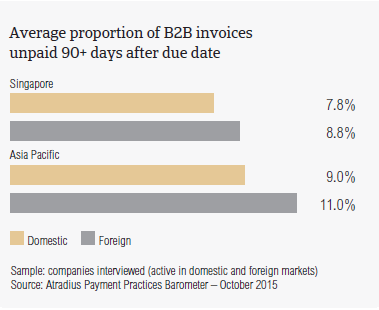 Domestic B2B customers of respondents in Singapore settle past due invoices, on average, 25 days after the due date. Foreign overdue invoices are paid by customers within an average of 23 days past the due date. The foreign payment delay is below the regional average (25 days domestic and 28 days foreign). This means that B2B suppliers in Singapore receive payments on past due domestic and foreign B2B invoices, on average, around 55 days after invoicing. Over the past year, the average domestic payment delay figure in Singapore increased slightly (by an average of three days), whereas the foreign payment delay did not vary. Conversely, there was a decrease in the total value of overdue invoices (3 percentage point decrease domestically and 8 percentage point decrease in relation to foreign invoices). The various reasons for the customers’ slow payment will be commented on further in this report (see below ‘Key payment delay factors’). Besides exposing businesses to a higher risk of payment default, delinquent account receivables cost time and money, and unless offset by higher sales revenues, they may negatively impact cash flow and eat into profit margins. This may explain why the highest percentage of the businesses interviewed in Singapore that consider a likely drop in demand for their products and services to be the biggest challenge to business profitability this year (21.5% of respondents in Singapore, versus 17.4% in Asia Pacific). This opinion, is consistent with the export heavy profile of Singapore’s economy. The responses for the region overall however suggest a greater concern about cost containment in maintaining profitability in 2015. Above the survey average is also the percentage of respondents (nearly 13%, versus 9.8% for Asia Pacific) who consider the collection of outstanding invoices the biggest challenge this year. This finding appears to be in line with what was observed about the DSO recorded in the country. Almost half of the respondents in Singapore (48.2%) said that late payments from domestic B2B customers were most often due to liquidity issues. This is slightly above the 46.3% average recorded in Asia Pacific overall. Notably above the 29.6% of respondents in the region is the 36.5% of respondents in Singapore stating that customers delay invoice payment intentionally, using trade credit as an alternative source of short-term financing of their business operations. In addition, domestic B2B invoices in Singapore are often paid late due to disputes over the quality of goods delivered or service provided (31.2% of respondents, compared to 25.8% in the region). Late payment from B2B customers abroad was reported to be chiefly attributed to the complexity of the payment procedure (44.4% of respondents in Singapore, compared to 39.4% in Asia Pacific). Two in five respondents in the country (versus 34.5% in the region) reported that foreign customers paid invoices late most often due to liquidity problems. The third most frequent reason for slow payment from foreign customers is inefficiencies of the banking system (cited by nearly 32% of respondents, versus 29.2% in the region). Late paying B2B customers often default, with the consequence that their receivables are unlikely to be collected, and written off as bad debts. The proportion of B2B receivables, written off as uncollectable by respondents in Singapore, averages 1.9% of the total value of B2B sales on credit in the country. This is almost in line with the 2% survey average. Consistent with the survey pattern, domestic write-offs outweigh foreign ones. This is likely to reflect cultural and language differences in international business relationships, which can impede collection efforts on foreign markets. Domestic and foreign uncollectable B2B receivables were primarily reported as coming from the construction, consumer durables, and services (financial, business and overall services) sectors. For most of the respondents in Singapore (51.7%), B2B receivables went uncollected because the customer went bankrupt or out of business (respondents in Asia Pacific: 54.4%). 44.8% said that B2B receivables went uncollected due to the failure of the collection attempts (38.6% of respondents in Asia Pacific). Circumstances in which the customer could no longer be located was the most frequent reason for receivables to be written off, according to two in five respondents in Singapore (35.5% of respondents in the region). Survey respondents in Singapore reported having granted trade credit mainly to B2B customers belonging to the chemicals, construction, consumer durables, electronics, machines and services (financial and business services) sectors. The longest payment terms, averaging 36 days from the invoice date, were given to domestic B2B customers in the electronics sector, and to foreign customers in the services sector. Domestically, B2B customers in the construction sector generated the highest levels of payments which went past the due date (around 45% of the total value of B2B invoices was paid late). Late payment from foreign B2B customers occurred most often in the business services sector (around half of the total value of B2B invoices was classified as overdue). For the majority of respondents in Singapore (65%), domestic B2B customers in the consumer durables and services sectors delay invoice payment most often due to liquidity issues. Looking at the machines sector, domestic customers delay invoice payment most often intentionally, using trade credit as an alternative source of short-term financing. The complexity of the payment procedure is a reason for payment delay from foreign B2B customers in almost all of the sectors to which respondents grant trade credit (around 35% of respondents were of this opinion). Foreign buyers in the services sector (60% of respondents) delay invoice payment most often due to liquidity issues, while customers in the machines sector delay due to inefficiencies of the banking system (45% of respondents). 46% of respondents in Singapore said that they do not expect any change in the payment behaviour of domestic B2B customers over the coming 12 months. 28% anticipate a worsening, particularly in construction and consumer durables sectors. 26% expect an improvement, most probably to occur in the chemicals sector. As to foreign B2B customers, nearly half of the respondents in Singapore do not anticipate any significant variation in the payment behaviour over the coming 12 months. 28% expect a worsening, most likely in the construction and consumer durables sectors. 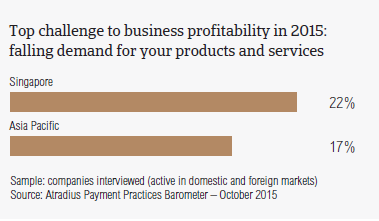 An improvement in foreign payment behaviour, mainly in the machines sector, is expected by 23% of the respondents. In 2015, Singapore’s GDP is forecast to grow a modest 3 %, and the production of chemicals is expected to grow at the same rate. After 3.1% growth in 2014, Singapore’s economic growth is expected to accelerate to 3.4% in 2015, driven by investment; among other things, in its infrastructure.